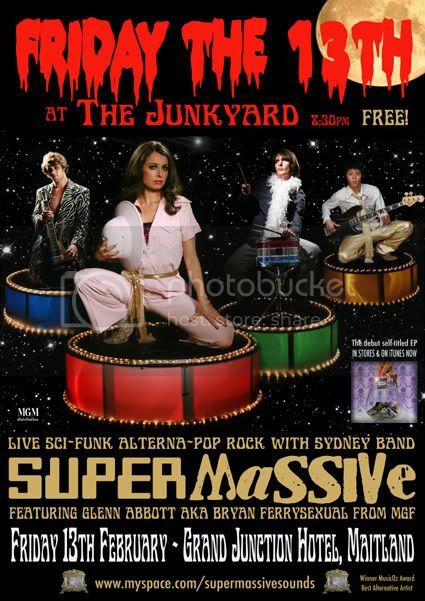 Award winning Sydney dance/rock band Super Massive team with fellow electro-funksters Yen for a very special night of electro/dance-pop at the Excelsior Hotel Surry Hills on Saturday 7th March. Newcomers Life Bitter Soul support. The night showcases three of Sydney's best up and coming electronic/dance rock bands. With all bands on the bill sharing a love of deep rhythm, shimmering synths, poetic pop, not to mention lights and lasers, it's set to be a spectacular, shimmy-shakin' night, if not an outright dancing frenzy, if both Super Massive and Yen's previous shows are anything to go by. 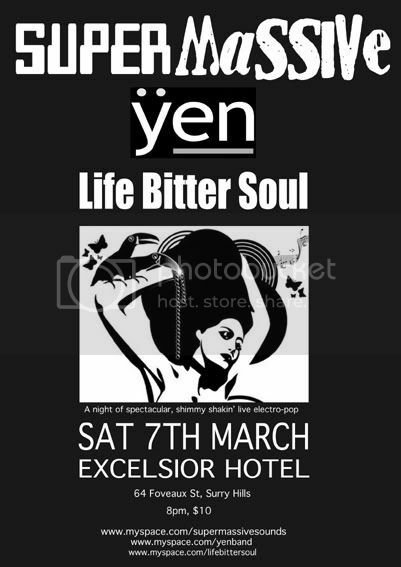 The show is at the Excelsior Hotel, 64 Foveaux St, Surry Hills. The night starts at 8pm. Tickets are $10- at the door. Sydney electronic rock band Super Massive wins Best Alternative Artist Award at MusicOz 2007, for their soon-to-be-released song "Fists". section on other styles) in Jerusalem. there's a music store on Shamai Street too where I later bought more cds. now to take a listen. a monthly jam of Solid Funk, Hip Hop, Old School 70's Breaks, Street-Disco & Classic Boogie with DJs Regal, Frenzie & Josie Styles.